One sure way to focus attention on a subject is to have college students compete for scholarship money by writing an essay. Being an impoverished college student myself, I am constantly on the look-out for additional funds to diminish the number of student loans I’m saddling myself with. I had never heard of James “Rhio” O’Connor before his namesake scholarship essay competition popped up on my FastWeb page. But, what an omission that turned out to be. After reading the entry rules, I clicked on the www.survivingmesothelioma.com website to delve into my subject, Mr. O’Connor. I had not planned to spend hours reading every page and available link on the website, and I certainly did not anticipate the compulsion to order Mr. O’Connor’s book to find out more, but that is what happened. I simply could not break away. In October 2001, James “Rhio” O’Connor was diagnosed with pleural mesothelioma, an incurable form of cancer most often, but not always, associated with previous exposure to asbestos. Specifically, mesothelioma is cancer of the mesothelium, the membrane that covers most internal organs in the human body. Mesothelioma that occurs in the chest cavity is called pleural mesothelioma, while mesothelioma in the abdominal cavity is called peritoneal mesothelioma. Patients diagnosed with mesothelioma survive an average of six to eighteen months. Mesothelioma is particularly deadly for a few reasons: 1) it is difficult to diagnose because the major symptoms—shortness of breath and pain in the chest for pleural mesothelioma, and weight loss and swelling of the abdomen for peritoneal mesothelioma—are similar to symptoms for other illnesses; 2) the patient’s history usually needs to specify asbestos exposure for the doctor to suspect this cancer; and 3) it is difficult to surgically remove the cancer diseased membrane, especially if the cancer is widespread. The prognosis for those diagnosed with mesothelioma is grim. Though this cancer can sometimes be slowed with treatments including radiation, chemotherapy, and surgery, it cannot be cured. When Rhio O’Connor was diagnosed, the location of his tumor made surgery too dangerous, he was too weak to tolerate radiation, and chemotherapy would have degraded his quality of life to an unacceptable degree. Mr. O’Connor was basically told to put his affairs in order because he had less than one year to live. Mr. O’Connor had other ideas. Unwilling to simply accept the death sentence he was given, he began his own personal research quest. He read, talked with researchers, doctors, patients, and alternative therapy clinicians, and eventually devised and embarked upon a treatment plan for himself. 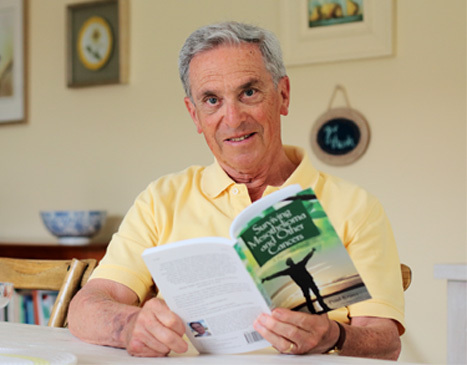 He wrote a book about his experience called, “They Said Months, I Chose Years: A Mesothelioma Survivor’s Story,” which documented his personal journey in treating his deadly disease without using any of the conventional therapies (surgery, chemotherapy, radiation) that are currently the biggest weapons in the conventional, cancer-fighting medical arsenal. Through his research, Mr. O’Connor found that conventional western medicine concentrates on the symptom (the cancer) rather than the underlying problem (compromised immune system) which allowed the cancer to develop unchecked. In devising his own treatment plan, Mr. O’Connor chose to focus on the original problem—his severely compromised immune system that was unable to control the cancer when it began—for his treatment. Mr. O’Connor developed a strategy to strengthen his own body’s natural defenses to control his cancer using a three-pronged methodology: diet and exercise, supplementation, and mind-body strengthening through positive thinking and stress reduction. He was successful for longer than anyone would have believed. To use a very common analogy, my own view is that having cancer is like having a war going on inside your body with your personal immune system army fighting the invading cancer army. The fact that cancer has been able to gain a foothold means that the immune system army is not able to adequately combat the invasion. The commonly accepted conventional medical response is to bring in an allied army to assist in killing the cancer soldiers with a “surgical” strike followed by chemical warfare in the form of chemotherapy and/or radiation. And while this “allied assistance” may combat the cancer, it does nothing to strengthen the home forces. In fact, though the allies target the enemy cells, they inevitably cause collateral damage to the already-compromised immune system army. On the face of it, employing good nutrition, supplementation, and positive mental energy seems a poor substitute for the powerful weapons wielded by the allied armies. However, these natural choices strengthen the immune system and empower the body’s immune system army to do its job. Whether used alone or in combination with conventional treatments, I believe that these alternative cancer therapies have an important place in cancer treatment and deserve recognition, consideration, and more scientific study by conventional practitioners and scientists. In his book, Mr. O’Connor did not advise against conventional medicine, nor did he advise that the path he chose is for everyone. He advocated that each person research and decide for himself the best treatment. I do not have cancer. However, for as long as I can remember, cancer has been a word that strikes terror in my own family. My mother’s relatives seem to be plagued by all types of cancer—many deadly. A couple of years ago, she chose to be tested for the breast cancer (BRCA) gene because of the prevalence of ovarian and breast cancer in her family. As I understand it, a person who carries a BRCA1or BRCA2 gene has a statistically much higher chance of developing breast, ovarian, or prostate cancer because of a mutation of the gene that prevents tumor development. My mother’s test results revealed an unusual BRCA1 variant that researchers don’t have much information on yet. But, whether or not this gene is eventually scientifically linked to a higher risk for cancer, the anecdotal evidence in our own family is pretty compelling. The fact that she carries this gene means that I have a fifty percent chance of having the gene myself. Prior to reading about Rhio O’Connor and his inspiring battle against the cancer that eventually took his life, I would never have known that alternative approaches to treating cancer exist. I think that is because I have been “brainwashed” into thinking that if a disease cannot be treated by modern medicine, then there is no treatment. Many natural health practices and cures are looked on as pure quackery by the general public. People today have completely put their faith into modern medicine and abandoned any responsibility they may have for their own health. Well, for me, no longer. I am energized by the prospect of taking control of my own health. I cannot control the gene’s I was born with. And, to a large extent, I cannot control the substances I may be exposed to that may in the future turn out to be carcinogens. But, I can take positive steps in my own life now to strengthen my immune system. I can personally commit to daily exercise, reducing stress in my life, and learning about good nutrition so that I can choose foods and supplements that will bolster my body’s natural ability to kill cancerous cells before they have the chance to grow. If I am ever diagnosed with cancer, I will follow Rhio O’Connor’s example by researching and exploring every possible treatment—conventional and unconventional—and participate fully with my chosen clinician in the development of my own treatment plan. In fact, though I haven’t been diagnosed with cancer, I plan to follow his example by taking part in my own health decisions in the future. Rhio O’Connor passed away on 11 July 2009 after surviving mesothelioma for seven and a half years. The world has lost a truly remarkable individual in Mr. O’Connor. His book should be a “must read” for any individual diagnosed with cancer of any type. His story was a personal inspiration to me and a catalyst for me to make better lifestyle choices to increase my health and decrease my susceptibility to cancer. The research I have done to complete this essay has led to a much larger benefit than just the prospect of a college scholarship. I am now convinced that I must be proactive in taking charge of my own health—particularly in light of my own family medical history. I will make positive changes in my own health choices based on the example set by James “Rhio” O’Connor.